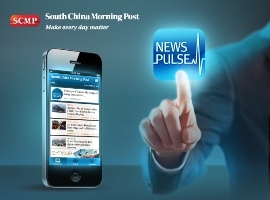 HONG KONG, 3 June 2013 –The South China Morning Post today announced the launch of their new SCMP News Pulse mobile app for iPhone and Android, which allows users quick and easy access to breaking and trending news. The app enables users to filter news by type and by Most Viewed, Most Commented or Most Shared. It also contains the latest multimedia content including videos and photo galleries, plus a new feature called iScoop, which allows users to submit their own news stories, photographs and videos. The app also allows Twitter, Facebook and e-mail social sharing and commentary.